The Moon. We've walked on it, watched it eclipse the sun and many of us will have spent many an evening looking at it as it sits above us in the night's sky. Another popular moon-related activity is to photograph it and with the right kit, a little understanding on how cameras 'see' and a bit of patience, it's actually not that tricky to capture a decent image of this giant lump of rock that we see every night. 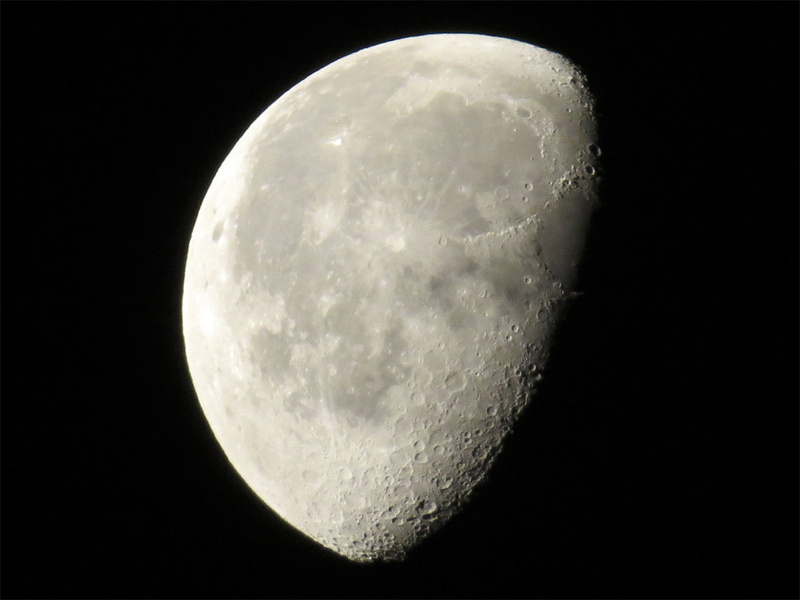 Obviously, you won't get very far without a camera and while most will reach for long lenses and their more advanced camera, it is possible to capture a half decent image of the moon with a compact so long as it has a good zoom range on it. If you are going for the interchangeable lens option, reach for something around the 300mm plus mark and you'll capture much more frame-filling shots. A tripod and remote release are handy, especially if you plan on capture multiple shots to blends together, and do wrap up warm. Once your kit's out and you've taken your first shot, you'll probably see an image that has a very dark sky with an extremely bright, white circle in it. This happens because the large amount of black surrounding the moon confuses your camera's light meter. 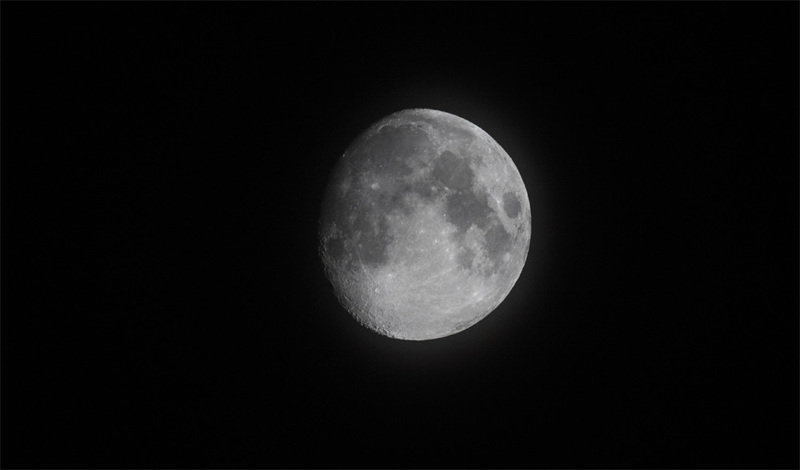 To fix this, dial down the exposure compensation or you can try using Spot metering (or meter manually) as this will tell the camera to take an exposure reading just from the moon. It'll also help if you use a smaller aperture (try a few test shots around the f/11 mark and adjust from there), particularly if you're noticing small spots on the moon which are appearing brighter than others as you'll be able to keep adjusting your settings (shutter speed, aperture, ISO) until most are removed. It's also worth remembering that using a smaller aperture will mean less light reaches your camera's sensor and as a result you may need to reduce your shutter speeds slightly but we're not talking so much that the movement of the moon is blurred (the moon moves quicker than you think). Try something around the 1/125sec mark and tinker from there.You'll also need to work rather quickly as spend too long messing with settings and you'll find the moon will have already moved out of frame and you'll have to adjust your tripod's position again. Right, back to exposure. What we've mentioned previously is great if you just want to capture a frame-filling image of the moon set against the night's sky but it won't really work for images where you want to capture some foreground interest as well. For this, you'll need to bracket your shots. Many cameras have a feature that automates this process but if your camera doesn't, you can do it manually. In a nutshell, bracketing is where multiple shots of different exposures are captured and merged together, either in camera or manually on a computer, to create one image that has all the elements you want to feature in your shot correctly exposed. Take a look at ePHOTOzine's 'Inspiration' section for more tips on this technique. If it's possible, you'll want to get away from towns and cities as light pollution can reduce the amount of detail you'll see in your moon shots and don't always think the sky has to be completely dark either as the blue of twilight can add an interesting twist to your moon imagery. The weather, how cold it is and levels of pollution can also change how your final image will look so do take plenty of shots and consider taking images on different nights, too. Your idea of the perfect moon shot will probably be of a full moon and there's nothing wrong with this, but to really capture the shapes and lines of the craters, wait until there's half or less of the moon visible. By doing so, you'll see how shadows and light emphasis shape and really enhance to 3-D feel thanks to the side-on light the sun creates during this phase. Using an app or having a look online for a moon phase calendar will help you figure out when will be the best time to set your camera gear up outside. You may find you need to boost contrast levels in your editing software or have a play with curves to pull detail that might have become lost but don't be tempted to adjust the size of the moon in your shot as this will just look unnatural and spoil the composition of your image.